Now, in other news not relating to triplets. Yes, I know you are patiently waiting, and believe me, I’m trying to do something about it. All in due time. In the meantime, I thought I’d write a post updating another milestone in our family. Toddler T is officially two, as of yesterday! And as you can see, this means his cuteness factor has double now that he has doubled his age. Even in his sticky, post cake condition. I was just going to write: “On your child’s birthday as a mother you always pause and reflect on the day your child arrived in the world.” And then I was going to post a photo of the day Toddler T was born. Then I realised that yesterday was so busy, and I was so scatterbrained, that I didn’t reflect at all. Whoops. I’ll pause and remember now as I post a photo! So, two years later and what a pleasure it was to celebrate our little boy’s birthday. Toddler T is a simply gorgeous child who is guaranteed to melt the toughest of hearts. When he knows you, he is the best welcoming committee ever – even if your absence was a brief as a trip to the shops. He will see you return. Hi face lights up as he yells out your name, jump up and down with his clumsy toddler jump, (don’t tell him I said clumsy, he has worked very hard to accomplish two feet simultaneously jumping off the ground, it’s not easy, do you know? ), come running to you and cuddle the first body part he can gain access to – normally your knees. 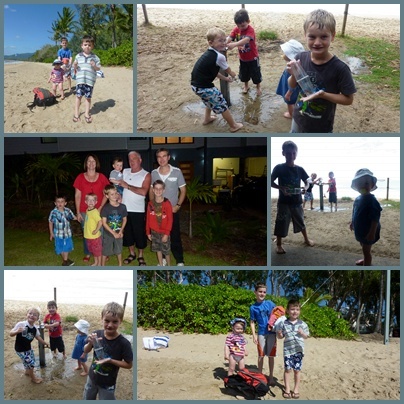 These greetings are given generously to grandparents, aunts, uncles, friends, even our cleaner! Of course, first thing on children’s birthday agenda’s is of course presents. Thomas is in vogue in our house now, so from Mummy and Daddy, an early engineers set. From the triplets, a snapping crocodile. But the absolute fav of the day, was a simple little Duplo motorbike from J Boy. (Hence why it appears in both of the above photos.) He told everyone he saw on his birthday about the bike! It was very cute, and a good indicator of future obsessions. Daddy is very proud. The plan for the rest of the day was to keep it simple and end the day with a quiet birthday dinner with family only. Even though Daddy had a day off work, there were a couple of factors which prevented the simplicity and peacefulness factor. 1. Life with triplets is not simple. 2. Life with a large extended family is not quiet. Particularly when this includes 6 children 2 and under! My day is now based according to the triplet’s feeding schedule in four hourly allotments. The block of time will begin with the first triplet’s feed. By the time all have been fed and burped and put back into their cots, 2 hours has passed. So then, all going well. I have two hours to do something. Yesterday my day disappeared as such. Session 1: Feed, breakfast, shower, general tidying up around house. Session 2: Feed, make jelly with J Boy, grocery shop, You will be surprised how exciting this can be when you haven’t done if for a long time. Even if you are tearing up and down the aisles hoping that you won’t receive an emergency “Need triplet assistance” phone call. I felt almost normal again somewhere in between the fruit and vegie section and the cereal aisle. A Birthday Train, Track and Tunnel Cake. ﻿ Ignored triplets because they were still sleeping, despite a feed being due. This allowed me to continue to rush around desperately as people arrive doing all last minute jobs. Session 4: Issue any empty handed adult relative a bottle of expressed milk and a triplet to feed. Continue to rush around. (I’m not sure what I did) Breastfed a triplet. Eat The Accountant’s speciality – gourmet pizza, made from scratch! Mexican Pizza was delicious last night. I was disappointed I didn’t get to taste his supreme, because The Accountant claimed it to be his best ever supreme creation. (Pizza production had occupied The Accountant the past two sessions, while also caring for the big boys.) Give children jelly to eat. Well received. Did the birthday cake thing. Well received. Especially from Toddler T! He treated it like a toy, driving the train through the cake. Poor Thomas had very trying conditions, with his wheels getting a little bogged in green icing. ﻿Afterwards Toddler T opened some more presents. He’s enjoys ripping the presents open, although he often needs to be convinced to open them in the first place, since he’s often got other things on his mind/agenda. Once the project is underway he embraces it fully and gets very excited by the new toy. It’s unnecessary to continue explaining what occurred in the remaining two sessions of this 24 hour period. Pre-dominantly because once everyone left, it consisted of my daughter crying constantly from 9pm until 3am. 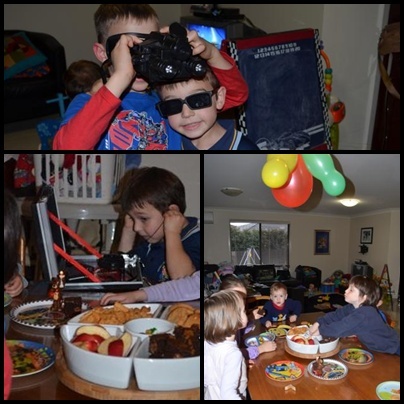 Toddler T loved his party with his most favourite people in the world. He is such a blessed child to be born into such a loving extended family. A big 2 year old looked after by his big cousin! Because tears are easily evicted from your tear ducts when you’ve had a wonderful day keeping busy with your Daddy and big brother, and a previously active night celebrating your cousin’s birthday. And then after you’ve spent a few glorious hours running around in the pitch black backyard with your cousins and siblings at your own shin ding. So when your brother takes your brand new dragon costume to look at first, tears signal that it is time for this particularly brilliant day to be closed by instantly falling into the satisfying deep slumber when Daddy carries off the birthday boy to bed. Happy Birthday my little one. Welcome to the Terrific Two’s. A quick post today to share with you the cupcakes J Boy took to pre-prep to celebrate his birthday with his kindy friends. When I spotted these cookie monsters here I knew instantly they were a great kindy option. Primarily because I knew they would be simple, which was the theme of birthday number 5 for me. I mean, you don’t even need to obsess about making the icing smooth – you are trying to reflect a monster’s complexion after all! I think the Serving Pink Lemonade cupcake’s eyes are a lot more reflective of the genuine cookie monster’s loopy cookie crazed eyes. However, my I don’t think my blog inspiration got the richness of an authentic blue cookie monster coat that I achieved. A last piccy. You have to angle the camera perfectly when you are 22 weeks preggo with triplets. Otherwise the shot looks like this. On Monday it was J Boy’s 5th Birthday. Don’t you just love a child’s excitement on these days? It started with an excited little boy running in and jumping on our bed. Of course he wanted his presents immediately and being the loving parents we are, we gave up any further plans to continue sleeping and headed out. J Boy had already scurried out in front of us and had been side tracked by the race track that he had received the day before. Daddy and little brother were happy enough to have a play with him. Present time! 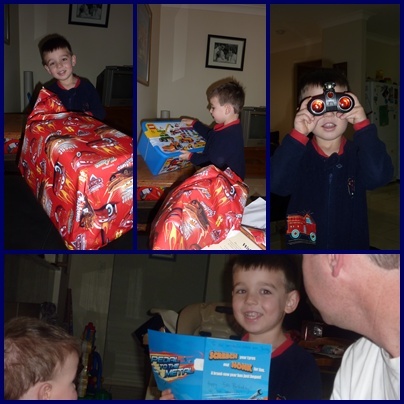 He loved the Lego set we gave him and the binoculars Toddler T gave him were also a favourite. Unfortunately Mummy forgot that it needed batteries. It’s a regular mistake I make with children’s toys, sadly. We went shopping during the morning and bought hot dogs for lunch and stocked up on the batteries then. Toddler T was supposed to go to bed after lunch. It didn’t go to plan, since I tried to put him down in his new big boy bunk bed. After putting him back to bed, over and over and over again, I gave up and put him back into his cot. However by now it all had become a revitalising game, so I admitted defeat and allowed him to come and play again. This disappointed J Boy greatly who wanted to play unhindered with his new toys. Luckily for J Boy, Grandma came and deported Toddler T to her house. This also gave me the opportunity to have a rest while J Boy kept himself occupied with his new lego. When I got up we got to work making the birthday cake. The only time I had made a cake on the day of his birthday was last time I was pregnant. I swore I’d never do it again. It took me hours to make a train cake and I was so stressed trying to get it done in time for the party. At least this time I was experienced and had planned a very simple cake. Due to me attempting to make J Boy a superhero cape the night before, and due to overwhelming tiredness I’d fallen short on time. Normally I stay up until at least 2am doing birthday preps, but this year it was 10:00p.m., lights out for me. And even then, I had no cape to present. I’d messed up the measurements and it turned out to be a slimline cape that was unbranded by any superhero signia due to me forgetting to buy the fusible webbing to iron the emblems on. So the cape is to be made another day. Luckily for me, I had convinced J Boy to have a farm birthday cake rather than a spiderman cake. I knew that it needed to be simple since I’ve got depleted energy supplies at the moment. The farm cake was a simple rectangle with green icing covered in green dyed coconut and chocolate icing for the dirt in the paddock. To make it a little more interesting than a plain rectangular cake, I built a hill in the grassy meadow – made out of gingerbread I had frozen in the freezer from Christmas. Then all we had to do was add the plastic animals, toy John Deere tractor and “The Bush” – a collection of yellow lollipops. (I can’t believe they were yellow – the wrapping was green!) Even though it was a super simple cake, J Boy loved it and was positive it was like Grandad’s farm. Sometimes I wonder why we push ourselves so hard, kids really aren’t hard too please. Also to keep it simple, I had avoided the big party with all his friends, (for the first time). We planned to go to the local Mc Donalds, with the grandparents, aunts and cousins, and a one family we are very close to. We thought we’d give the kids a play on the playground, feed them a Happy Meal and get a relatively early night, especially since some of the kids had school the next day. 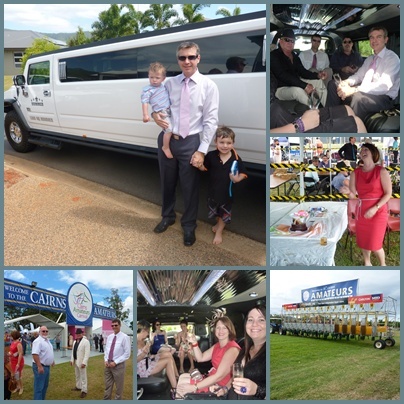 Would you believe, we arrived at Macca’s to discover the playground was closed? Of all the days, they had decided to bleach the playground and shut it down for a few days! J Boy was in tears and devastated. We decided to walk across the road and get pizza at the local tavern – which happily also has a playground. The kids were happy. It wasn’t an early night by the end, due to meals taking a bit longer than at Macca’s. 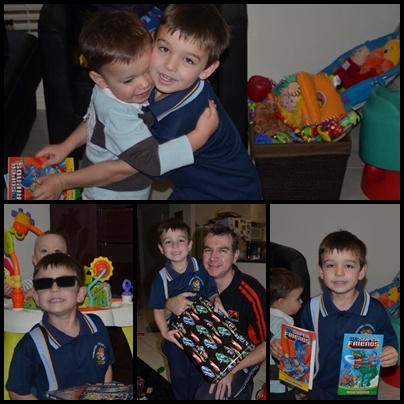 Everyone was gracious though and J Boy had a brilliant night, and of course he was very happy to receive more presents! My neice indulging in birthday cake! There is few things in life that make my heart happier than celebrating my children’s birthdays. So hooray for the baby’s first birthday! You always have to have the first birthday cake photo, and I love this one capturing the thrill (and possibly sugar high) of eating your first birthday cake. 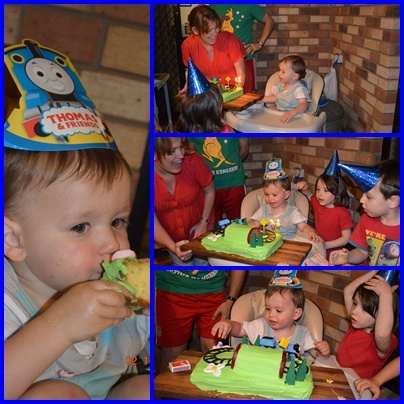 Trent’s birthday was on Tuesday and he also had a first birthday party on Saturday. So he has now properly celebrated the momentous occassion of turning one, and now he can get down to the busy business of being one! The party went well, we had a first birthday Teddy Bears Picnic. The kids brought along their favourite teddy’s. Which was great for a game of “Musical Bears” which was basically Musical Chairs only instead of the kids sitting on chairs, they had to sit their bears on it. A little easier for that age group, and the kids LOVED it! After games we had afternoon tea. I was particularly happy with the service of this. I found some noodle boxes, which I bought in bulk which made them quite affordable. I wish I had found them at this price sooner, because I would have decorated the plain white boxes with glue and ribbon, perhaps some felt teddies glued on, would have also made a nice touch. But anyway, I filled the boxes with food and handed them out. So easy! It saved on preparation time, because I didn’t make a selection of goodies, the only baking was enough teddy bear shaped sultana muffins (nice and easy) for each child. I also included tiny teddies, chocolate teddy bikkies, a bag of fruit, a bag of gummi bears and a sandwich cut out in a teddy shape. One drawback was food wastage, as not all children ate everything. You could get the parents to choose the foods to go into the boxes to avoid this, but it would be a little more time consuming. Teddy Bear Party – Party bags. I couldn’t bring myself to buy cheap plastic toys that fairly promptly are disposed of for a one year old’s party. Instead I did goodie bags. (Bought the small clear plastic bags in bulk several years ago, had just enough left for each child.) I made teddy bear shaped sugar biscuits, iced them and put them in the bag with a few soft lollies. (in honour of the gummy baby and his little toothy pegs!) Much more economical, didn’t contribute to landfill and homemade always feels nicer to give away anyway! Of course the birthday cake had to be a teddy bear! It’s actually become a family tradition. Mum made this cake for myself and my 2 sisters and brother. J bomb also had him. I was a bit rushed icing the cake, (was out the night before and didn’t start icing until 11:00pm. Eeep!) so I wasn’t 100% happy with him, and somehow I cut him so he was quite lanky. But never mind, the size of The Baby’s smile when he first saw the cake reassured me that bubs aren’t to fussed with the finer details! It was a lovely party. The weather was lovely, pefect for children playing in the garden. The baby had such fun toddling around to his heart’s content, there was always someone to look after him! Being a social baby, he also loved having so many kids to watch and be around. I think it’s safe to assume he enjoyed the celebration. On his actual birthday The Baby (for now, fast turning into The Toddler!) decided to start the celebrations quite close to 4:01am, the time he was actually born 12 months earlier. Needless to say, The Accountant and I considered this gesture completely unnecessary. In the afternoon his 4 cousins, 2 Aunty’s, Grandma, Grandad, Great-Grandad and Great-Nana came around to visit and help consume cake and teddy bear biscuits. Quite the family affair! Such a blessed boy to be surrounded by people who so completely love and dote over him. We feel so very blessed that God has added Trent to our family. He is our little mischievious monkey, full of cheeky smiles. He’s cuddly and cute as pie!